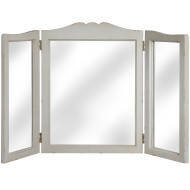 A good mirror in the home is essential for two reasons. One, it’s obviously a useful thing to have, and two, they make a for an attractive decorative piece. We have a range of mirrors here at Hill Interiors, in lots of different frames and sizes - so you can offer your customers a choice.